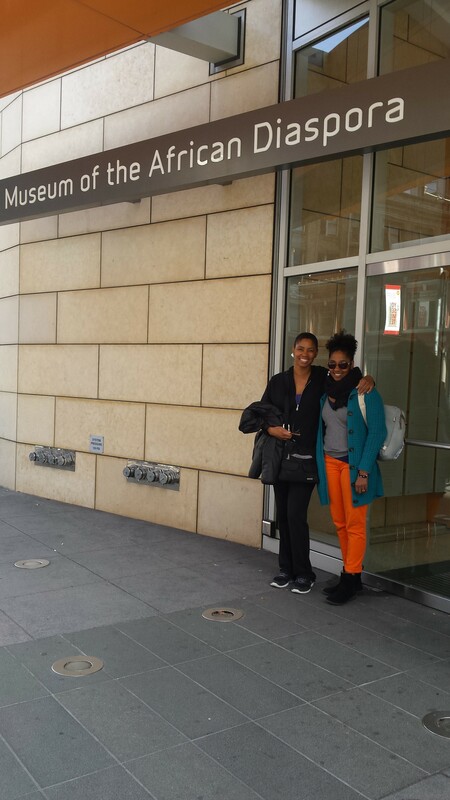 On the first day of Black History Month 2015 I found myself back in the bay area visiting my sister, and again she generously agreed to join me at another museum on the list. We had visited MoAD in 2013 and saw a wonderful Gordon Parks exhibit, and I was eager to return officially for the Our Museums project. 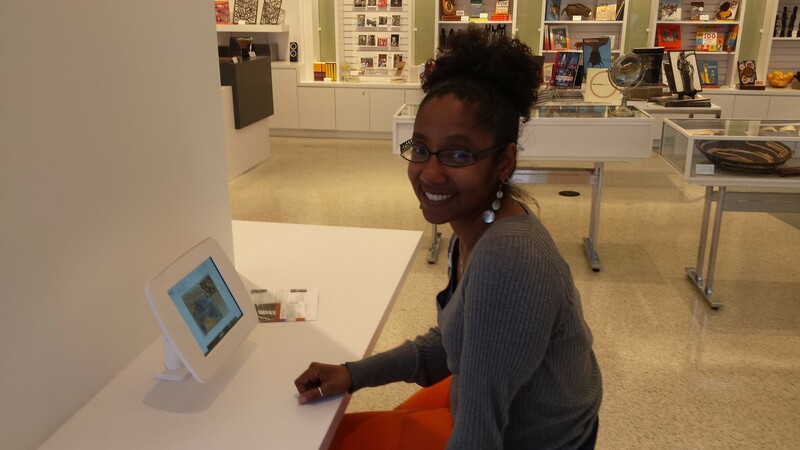 For this visit, Trina de Chalus, MoAD’s Director of Retail and Visitor Experience and Lovisa Brown, Director of Education, welcomed us to the newly renovated contemporary, urban, tri-level, museum. I introduced myself as we checked in and paid the entrance fee and described this project. I explained that I was visiting African-American themed museums, and I was immediately corrected that MoAD “does not consider itself an African American Museum,” which is understandable considering the word “Diaspora” in the name. The museum’s mission states, after all, “The Museum of the African Diaspora (MoAD) showcases the history, art, and cultural richness that resulted from the migration of Africans throughout the world.” I could see why the museum’s educator would want visitors to understand the intent of the museum’s exhibits to span beyond the U.S. borders. Despite the museum’s diasporic emphasis, the two primary exhibitions at the museum for our visit featured the work of African-American women artists, Lava Thomas and Elizabeth Catlett. My sister and I started in the Thomas exhibit, Beyond, and found ourselves face to face with human-body-themed works including drawings and photographs of hair and teeth along with vaguely organ-shaped sculptures. I was pleased to be newly exposed to such a creative contemporary Black artist. Her realistic drawing of a severed dreadlock ponytail, part of her Lavaville series, stood out most to me, with its impressive depiction of every hair. We spent a little time at the end of our visit in the museum’s lobby where iPads are set up for visitors to explore online exhibits. I spent the most time exploring an online exhibit on food of the African diaspora. The exhibits include videos and audio files. I watched a video on the use of beans across the diaspora and learned about foods brought from West Africa to the Americas and how their use has evolved over the centuries. My experience in this museum was dramatically different from my experiences in the African-American history-themed museums I had visited just prior to this one. While the other museums offer regional history lessons in permanent, text-heavy exhibits, MoAD is designed to continuously welcome new, diverse traveling exhibits and display art and cultural artifacts from across the diaspora in a sparse, contemporary setting. I love to see a contemporary museum featuring Black artists and exhibits from around the world, but I did miss learning about the history and legacy of San Francisco’s African-American community. I guess there’s always room for one more museum. Check back next Monday, April 13, for a look at African-American Museum in Philadelphia.